Same problem and my browser is set to 100. Any hints? Have you applied the .smaller-image class to your img? //and screen shot 1 test passed, but browser challenge still persists. Sure:) just have had the https and word link omitted as mentioned previously. Plse delete opening [and closing] else it’s unable to send. Also use the code formating when posting code. Thanks guys well spotted, but it still shows the browser challenge undone? Why do I see <class> tag in there? What is going on? 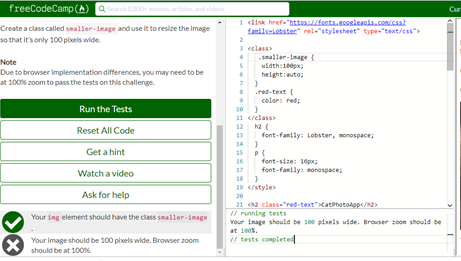 I belive that by typing “.smaller-image” you are creating that class, so you can use it along your code, but as i’m still very new at this, I could also be wrong. Hope it works for you! Amazeballs! I’ve been blessed with twins!